Oceanside CA— North County Serenity House (NCSH), a program of HealthRIGHT 360, held a ribbon-cutting ceremony on Friday, January 26, 2018 for its new outpatient substance use disorder treatment program in Oceanside. With the capacity to help 70 clients at any given time, the program is the only of its kind in the North Coastal region for pregnant and parenting women, including teens. Childcare center at the facility. HealthRIGHT 360, one of the largest community healthcare providers in California, is known for integrated programs that empower clients to be proactive in their own recovery. Participants of the NCSH program will have the flexibility to create their own path to recovery through trauma-informed services in an environment designed to empower clients so they can develop support systems and healthy coping skills. An individualized treatment approach is built in collaboration with each client to their unique needs and expectations. “We pride ourselves in providing services to individuals who are otherwise unable to receive that care,” said April Wilson. 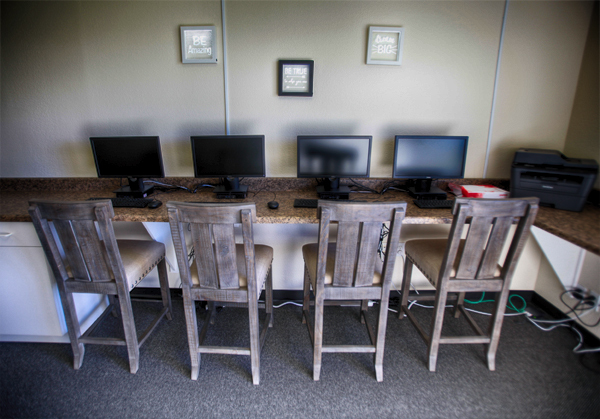 A computer lab is available to clients in the program. “This is about a road to recovery,” said Oceanside City Council-member, Jack Feller as he held up his chip from A.A. Council-member Feller told the audience that he is two months shy of 35 years of sobriety. “This facility is going to be perfect for the young people that need it. The mothers have such a hard task of raising children and being part of the family. We are encouraged everyday, in the City of Oceanside, by the community that comes together and helps families.” Council-member Feller then presented a proclamation to the people of Serenity House. Services provided by the program are evidence-based and include individual therapy, parenting coaching, vocational readiness support, relationship skill-building, emotional development groups and self-efficacy and empowerment groups, along with daycare and a computer lab. NCSH also has an on-site homeless outreach program that offers case management and housing resources for people living on the streets.